LegalTech NY is next week and it’s time to network. Over the years, I’ve grown more interested in the easy networking opportunities (since I live in NYC) than the content at this event (I find it a little too e-discovery heavy). As I was planning my week, I was reminded of a new iPhone app that I recently downloaded. It’s called Here on Biz. In a nutshell, the Here on Biz (HoB) app adds location awareness to your LinkedIn account allowing you to connect — and meet up — with people around you. So, say you’re on a business trip (maybe for a legal trade show in New York) and you want to kill some time by finding other business folks who would like to meet up for some networking. Here on Biz provides you the way to find others looking to do the same. How to use Here on Biz. Download the app (link) and sign up by connecting it to your LinkedIn account. When you launch the app, Here on Biz locates you and shows you fellow Here on Biz users in the area. 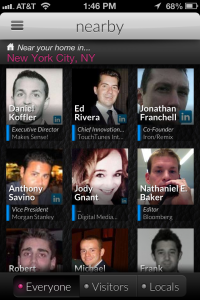 Check out the profiles and if you find someone interesting, click the plus sign to add them to your HoB network. When they accept the invitation, you can start a chat and arrange a meet up. HoB has been described as Foursquare for business. Another nice feature, that should be applicable to the LegalTech crowd, is the ability to check in at a nearby event. I haven’t used this feature yet, but When I get to LegalTech, I’ll do so. I invite you to connect with me on Here on Biz. And maybe we can connect (for real) at LegalTech.